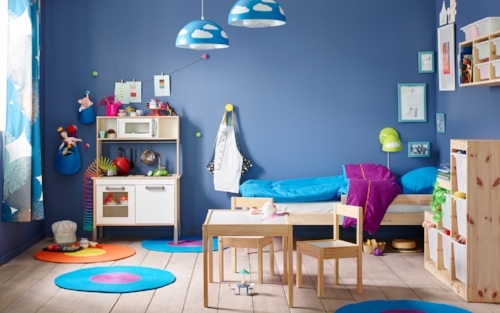 Decorating a child’s bedroom should be exciting and fun... But too often the reality can be so much harder! There are so many items to choose from, which can make picking one thing difficult. Then there are all the product recommendations of what others say you definitely ‘need’ to have and especially if it’s your first child, you don’t know what to purchase and what to leave on the shelf. Moreover, most products for boys tend to be blue and most items for girls usually pink. It can all be a bit samey and a bit predictable. A lovely girl's room. Soft creams, greys and whites with touches of pink, gold and teal makes for a relaxing and personal bedroom. So when you’re faced with so many choices, how is it best to start? Firstly it’s important to remember to just keep things simple. Look at what is actually necessary…. All your child really needs is a cot or bed, perhaps somewhere to change them if they are in nappies and a place to put their clothes. As time goes by the changing area can be removed to make way for a desk or table. There are a lot of ‘extras’ on the market and it’s so easy to get carried away and excited by them all. But if budget and time are tight, then wait and see how your child grows and what she or he shows an interest in before buying everything in advance or when they are too young to appreciate it. A little one's room doesn't need much. Simple spaces are perfect. A cosy room for two to share. The different cushions on the bed and letter pictures on the wall above help personalise the areas. I love the touches of colour and the star print lamp shades bring everything together. Secondly, neutral does not mean boring. 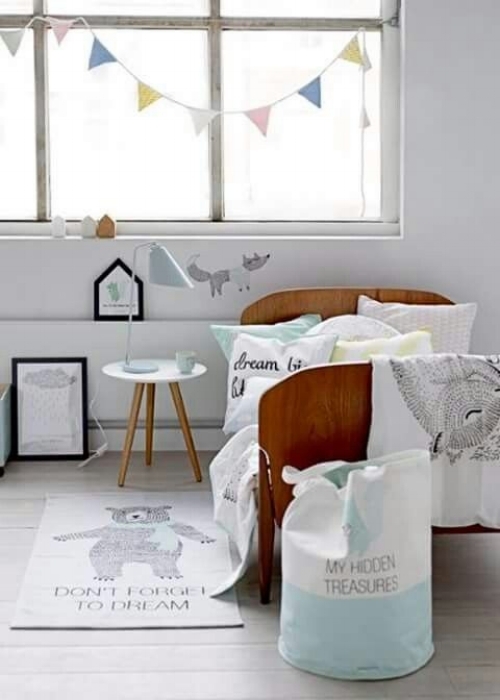 It can be much easier to have neutral walls and then add bright accessories or themed soft furnishings to the room which can be changed and adapted as your child grows up. Blackboard paint on wardrobe doors or a wall is a great way to allow children the chance to personalise their own space. And wallpaper can be framed or used on small areas or feature walls to incorporate a favourite theme. Fun accessories add interest and colour to the room. Ask any parent about having children and there’s always a story about sleep. Or lack of. If you’re still umm-ing and ahh-ing about what colours to choose and want something more colourful, then look towards the psychology of colour for inspiration. Apparently the best colour to paint a bedroom to promote sleep is blue. Yellow is a pretty close second, followed by green. These colours are calming and promote relaxation. Incidentally, purple and brown are the worst colours. So if you’re stuck with what paint shade to go for, start with these and you may find that your child (and you) benefit from a good night’s shut eye. What an inviting room this is! Open shelving, bright cushions, white accessories and the warm wood floor peeping from beneath the rug lift the room and make it fun and appealing. A lovely shade of blue on the walls. Blue is definitely not just a colour for boys! The blue wall colour here is a bold choice, particularly as the floor is dark, but together they look beautiful. This is because the cream colour wall two thirds up helps to soften it. They've cleverly used pictures, wall and ceiling hangings and shelving to bridge the two colours together. The white drawers, rug and wooden cot lighten and brighten the overall scheme. A relaxing and cosy room. A grown up room. Grey goes so well with yellow and the dark wood flooring anchors everything. Pink and yellow work well too. A happy room. The furniture here really maximises space and the green colour is calming. A big window lets in lots of light and brightens the room.